Leeks are a good candidate for freezing for future use, just follow a few simple steps to clean and prepare them first. This is a guide about freezing leeks. Leeks look like giant scallions, only with bulbs that are straight and cylindrical. Look for crisp, fresh, dark green leaves and stalks that are firm and pliable. The bulbs should be white, with the white color continuing 2 to 3 inches up the stalk. Small and medium-sized leeks usually taste best. Wash leeks carefully to remove grit and small insects that might be trapped between its tightly fitted leaves. To do this, trim the tops and slice the leek into quarters down to within 1 1/2 inches from the base. Fan the leaves, and holding the bulb end, swish the stalk end around vigorously in a sink filled with ice water. Slice or chop into smaller size. It's best to cut up this vegetable up before freezing for the sake of finding suitable containers and saving space in the freezer. Tray Pack-Place a single layer of prepared leeks on a cookie sheet and freeze. Once frozen, transfer to plastic bags or another suitable container. Seal, label and freeze. The advantage to tray packs is being able to separate vegetables easily as needed. Dry Pack-Place prepared pieces directly into suitable containers. Seal, label and freeze. Freezer containers should be moisture and vapor resistant and should not be prone to cracking or breaking at low temperatures. Containers should provide protection against absorbing flavors or odors and should be easy to label. Suitable packaging for freezing leeks includes freezer grade plastic bags, rigid plastic containers or glass containers and heavy duty aluminum foil. 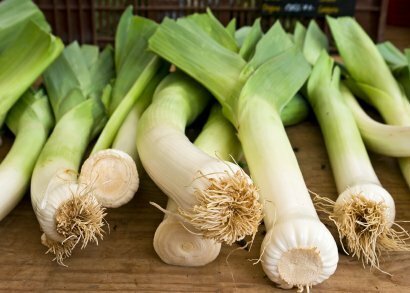 Add leeks directly to dishes without thawing. 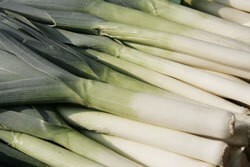 Leeks are available year round but are best during the early winter and spring. Remove excess moisture by blotting with a paper towel. Place in perforated plastic bags and wrap in plastic. Store for 1 to 2 weeks. I have some homegrown leeks in the garden, too many to use in just one meal. I want to know if they can be frozen. If so, do they have to be blanched, and for how long? Leeks do not have to be blanched before freezing. Here are some tips for freezing leeks. Can I freeze leeks or is there any other manner to preserve them? How do you freeze leeks?